Pictures of in-progress work and completed photos available below. 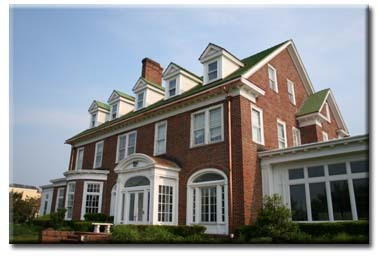 Original Tile from 1902 was recycled to be used to restore this historic mansion in Deal, NJ. New age materials were mixed with old to produce a permanent solution for this worthy structure. FSI Restorations has been involved in old-world style craftsmanship and the restoration of these relics of the past for decades. The experts of FSI Restorations knew right away that the original Ludowici tile of yesteryear was certainly worth another lifetime, or two. All that was needed to achieve a salvaging, reconstruction, and return of this relic roofing system was knowledge and leadership. After careful review of competitor's estimates that included removal and disposal of perfectly good tile, the owner of this relic chose the common-sense approach offered by the industry leader in old home exterior restoration. The competitors offered such amateurish and unproven materials as composite and rubber tiles and vinyl siding for the dormers. Clearly these were proposals not worthy of this relic of turn of the century architecture. Over the years, the endless trips up the ladder by painters in efforts to paint the third-floor dormers had caused irreversible damage to the roof. The integral guttering had been lifted and contorted because it was connected to the cornice, which was, in turn, connected to the brick veneer walls. The brick walls were subject to heaving from the rusting of the ferrous metal lentils. An engineer brought in by the company estimated a seven-fold growth in the rusting areas of lentil and sill supporting angles. This thrusting of the brick caused major damage that was capitalized upon by major vine growth and the continuing water infiltration caused serious damage to the building. The original cornice was built upon the brick. These details, along with the integral gutters were thrown out of alignment and the pitch of the guttering was skewed. The drop-type integral gutters began to split and this caused major leaks that were serviced with stop-gap tar and patching over the years. Through the wisdom of a discerning owner and steward of this property, FSI Restorations. was able to service this mansion of history. The contract was awarded to Four Seasons Industries in late 2006. The estimation of approximately 30% loss of the original tile was dead-on accurate. The constant and feudal maintenance of the dormers and cornice ended with the fruition of a carefully pondered plan to restore the wood siding and cornice details. Hundreds of Fypon Dentil Brackets, bands of AZEK mouldings, ribbons of James Hardie Fiber Cement Lumber Frieze and Fascias and Clapboard were carefully used to restore the original details. A "Bulletproof” finish was factory applied to the products before installation. First the overhangs, cornice, and integral gutters had to be gutted to remove them from the pressure of the brick that has been raised from the rusting of the lentils. Rebuilding these elements proved to be challenging. The first segment of the job was the third floor and the new cornice had to be free of the brick. Future brick replacement is planned for 2007-2008. The roof was removed and the original, salvaged tiles were carefully segregated, counted, and palletized on the ground. The stacking of the tile was an enormous task. The roof deck had surprising, little damage. The type of old pine boards that made up this original deck usually last a long time, as long as they are afforded the ability to dry. New decking was installed in an overlay process. A 4mm SBS Modified Bitumen Roofing System was installed. This underlayment provided a two-fold purpose. Temporary cover was of crucial importance as the home was fully furnished. The tile roof requires a formidable underlayment, especially on the ocean front with exposure to high winds and ferocious storms. The cornice was restored, gutter removed, and the siding was restored. The siding work was done over the underlayment. The siding was raised off the roof plane on a 2x4, which was counter-flashed in copper and prepared for the roofing base flashing. James Hardie recommends that siding not be installed right onto a roof. This method proved not only functional, but beautiful, as the exposed copper lends value to the building. Copper treatments were added at the Colonial Return Roofs, Pent-Eaves over the Dormers, edgings, etc. A custom ventilation plan was followed to allow the proper ventilation of the building. Copper 6” Half-Round Gutter was installed, with 4” Smooth Copper Downspouts, with new custom Leader-Heads. Other work was done such as an exterior Ceramic Tile Patio. The additional work and subsequent work will be uploaded to the web as this is an ongoing story. The brick work is ahead and the story will grow as the project continues. Memorial Day to Labor Day in Deal, NJ, there is a moratorium on outside work and our crews finished up the day before! Click on the thumbnails below to view larger photographs. CONTACT US We won't leave you waiting around. Our estimators are on the road Mon - Sat, so feel free to request a no-hassle estimate.